Good hiking boots have always been very difficult for me to find. Until two years ago I tried four different brands without success. Finally I purchased a pair of Targhee Mid II from KEEN. They have been fantastic, comfortable and worn to death! These boots are quite lightweight and not your classic “hiking” or bushwalking boot. They served me very well for over two years. 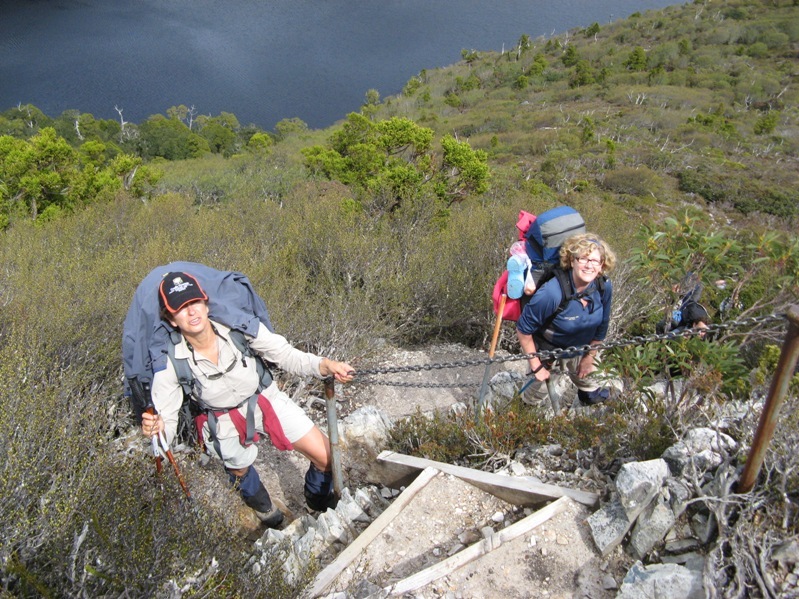 This included two Overland Track’s (one in snow, the other wet), the South Coast Track and many, many day walks. Unfortunately they finally succumb to the hard work I dished out and died…… Sad but inevitable. So being back in the market for new boots, what did I buy to replace them? The same ones of course! Above, the new boots, never worn. Above – more comparison, it was about time to replace them. This brings up the main problem with the Targhee Mid II, the “4mm multi directional lugs”. Those little red strips of webbing take the place of eyelets or hooks in the boots for lacing. They are the weakest point in the whole design, especially the top ones near your ankle AND the bottom ones, near your toes. Note on my old boot, three of the eight lugs are torn. I was warned about this when purchasing them from our local Mountain Designs store (on a 25% off day @ $205) . I have been very careful tightening the laces, making sure I did not put undue pressure on the lugs. The first fail came after about 18 months of wear. It might have been caused by hooking my boot on a tree root, can’t remember. As I had expected this for months, and the boots were so comfortable, it was not a concern. Others may think differently. The second problem is harder to quantify, the Waterproof claim by Keen. When we hike it is usually on formed tracks. We like to keep on track, i.e. not walk to the side, widening the track or damaging the area more than has already occured. This usually means walking through mud or water and it really tests out any waterproof claim made by boot manufacturers! These boots were waterproof, for a time, BUT not fully waterproof under the conditions I frequently used them. I think the weak spot is where the upper (non leather) piece attaches to the base. Water seems to leak in there but it is hard to prove and could have been the depth of the puddles and mud I tend to walk through. Because I really opted for comfort AND expect wet feet this has not been an issue. I love these boots and and put up with their shortcomings in exchange for comfort and no blisters! 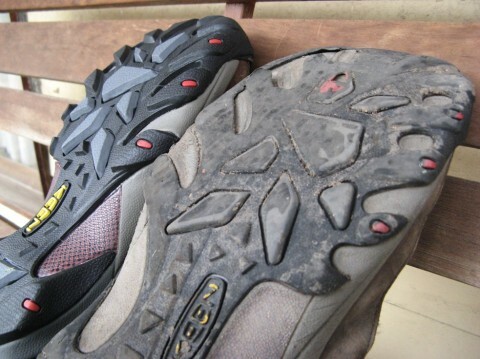 Have you ever compromised on comfort over flaws in boots or other gear? Do you have a favourite hiking boot you purchase, no matter what? Shoot us a comment below and share your ideas. Funny, just two weeks ago I purchased a pair of hiking shoes. After checking out every hiking store in the city I decided to buy a pair of KEEN shoes, they look almost like yours, except that mine are shoes and not boots. I can confirm what you wrote, they are very comfortable and I’m happy so far, but the one thing that concerned me from the beginning were those lugs you mentioned. It’s an unnecessary design feature without any real benefit, I can’t imagine they will last long, so I need to be careful. But then, they were not only the most comfortable, but also the most affordable shoes I found, so if they break after a few years, I would just buy them again I guess. The sales guy also reminded me to keep the checkout docket, for warranty reasons. Might have a look at Vasques next time I get near a boot shop. You do love em! I’ve got a pair of Brasher Hill Master GTX. They’re not sold in Aus, I bought them in the UK when I was living over there for a few years. They are a light, full leather boot with Goretex lining. I’ve never had blisters, or wet feet. Even when walking in muggy SE QLD I’ve never had “sweaty” feet either which is great! If I was in the UK I would buy a pair again in a shot, but the cost of posting them back for warranty would be a bit steep. I’m just about due a new pair of boots, and I’m going to be sad to see my old faithfuls go! I’m not too keen on the idea of the lugs breaking off the Keens and would lean towrd a full leather boot anyway – just my preference. I’ve had the Brashers for almost 10 years now! Thanks for dropping by and your interesting comment. Agree re the lugs and full leather but I had tried those before and failed. I just was not prepared to splash more $$ to see if they would be comfortable. Good luck in your new boot hunt! Great advice thanks – you need to get OUT of the water! Agree re fabric eyelets but it is a risk I was prepared to take. 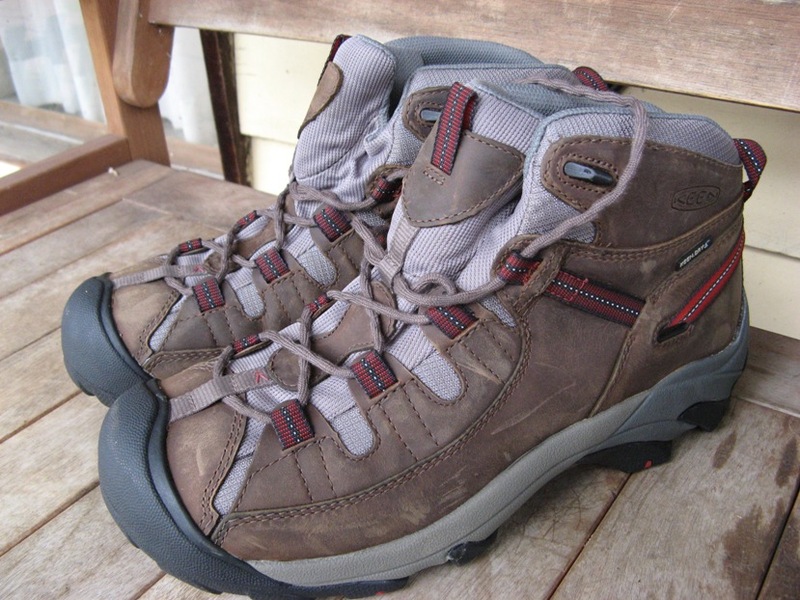 These are also my favourite boots – the Keen Targhee Mid II – I too am on my second pair. They are very comfortable, and my physio friend is impressed with the foot ergonomics. 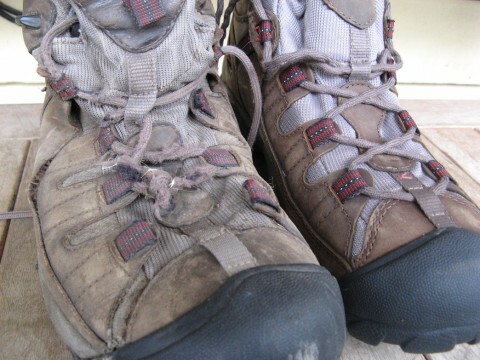 Two of my hiking friends have been so impressed they too purchased a pair, one buying the boot AND the shoe. Despite the comfort, and buying two pairs, the shoes fall apart quickly. The glue holding the black sole to the grey sole fails and the black parts slowly peel then break off. This starting happening within 7 days of walking for the first pair, and within 10 walking days of the second pair. As mentioned in the article, the lugs wear through, but this only seems to happen when they get wet. I’ve not had a problem with the waterproofness of either pair. My second pair needs some gluing now, the first pair I tried various glues but none worked, this time I might go to a shoe repairer. I could claim on warranty, my friend did, but all that happened was the shoes were replaced and the glue on the second pair also failed within 10 walking days. Weird we have the same boots. As you say they are very comfortable. It is strange that the shoes fell apart. Thanks for the great comment and feedback to the discusssion, appreciated! Btw, your site should be recommended viewing and reading for anyone looking for a bit of adventure. Where do you ge the time???? Thanks. I love hiking, photographing, mapping and writing, so it’s pretty easy to keep a blog when combining things you love to do. I’m a big believer in sharing infomation about hiking routes as well. Mine are the Keen Dry. I don’t know what the old ones were and have thrown them out so I can’t check. I have not tested the waterproofness on these yet but they are, at the least, very comfortable! Good choice with the Keens! 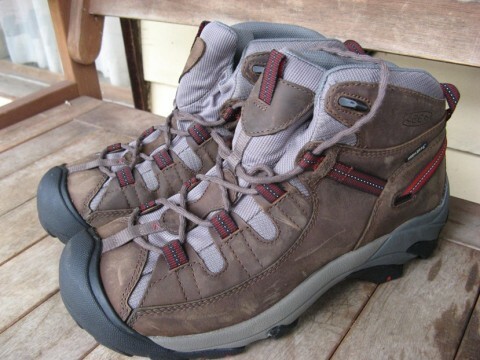 I actually just bought a pair of Keen Pyrenees to see me through this hiking season. They came highly rated from the Park Rangers at the Grand Canyon who logged literally thousands of miles in them this last season. I’ve always been a Merrell guy but I’m expecting good things from my Keens this year. I plan to put them through their paces! Hey Trail Guy, thanks for visiting! Yep, sold on the Keens, might get a pair of walking shoes next time I am cashed up so I don’t trash my “goodies” walking each night! At this moment I wear CAT Nitrogen for three months and surprisingly they serve me very well. I bought them because CAT leather is quality and I wanted to try them. I hope they are durable enough for my hiking style. I hardly can find boots that would endure for more than a year. I love Keen. I have Keen Targhee II shoes, and wear them almost every day. 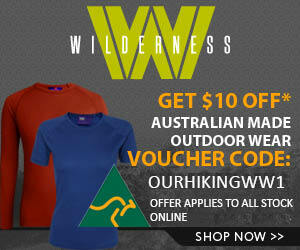 I recently wore them on a 6 day pack hike through the Tarkine Rainforest and they were awesome, stayed dry when it was raining and wading through shallow water. Nice and sturdy. I am considering getting the Mid version also so that I can wade through slightly deeper water without having to switch to my Keen Newport sandals. But I love the shoes. Six days in the Tarkine would have been brilliant! Was that on a guided walk? Bought a pair of these boots for my 3rd time over the Overland Track, and for the first time that I can remember – no blisters! Great, comfortable boot. Wouldn’t win a fashion prize but who cares! Great convo. I bought the Keen’s a they were the most comfortable. Up and down Stairase/Eskdale spurs at Mt Bogong and no problems. Then a couple walks along the Catherdral Ranges ridge track. A very rocky and uneven track. 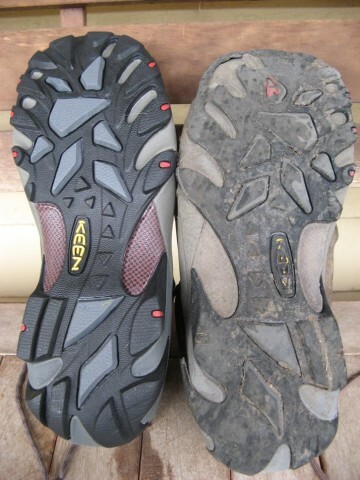 As I took off the Keens I noticed both outer edge grip lugs on the sole had partially pulled off. This happened on both shoes! The most comfortable boot but I’ve now switched to leather Zamberlands. They’ll need a decent wear period but hopefully tougher and more waterproof. The Keens are so comfy – maybe I’ll but another pair for day walks with lighter packs!